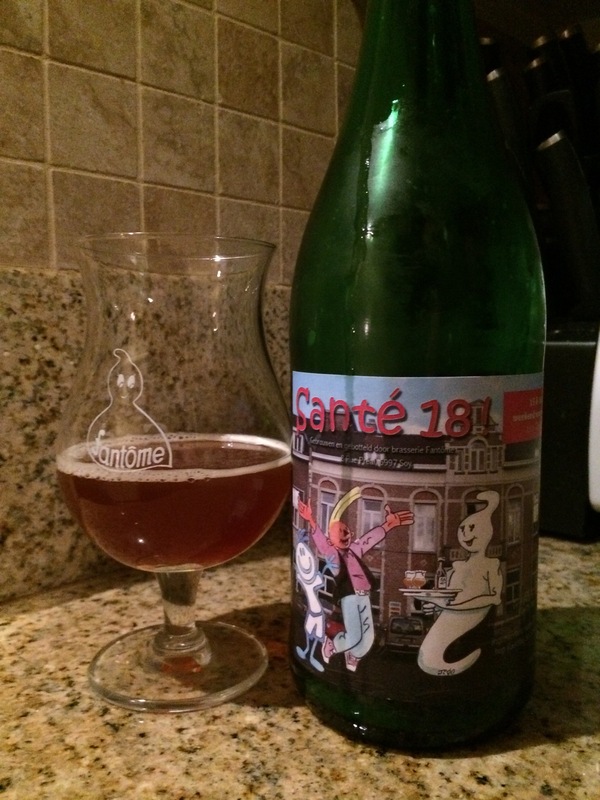 Fantome sante 18, this time for the kindergartens. Trick love da kids. Every year Dany brews a Sante saison for some charity of his capricious choosing. This year it was for a kindergarten or something, I can’t read all these words, the label looks like a 1930s racist cartoon is serving someone beer in an Italian piazza. Who knows. The smell here is kinda like the 2014 flat Ete mixed with a rodenbach or something. There’s currant, cherry cordial, a sort of biere de garde metallic aspect and closes with a subdued clovey yeasty aspect. The taste is far better and is lightly tart, some sucrets and red sour patch kids, a grassy dryness to the middle that closes oddly clean like Dark white. Once you turn 18 your parents get divorced and you realize you are truly on your own in this sartorial crushing saison existence. This is the same and the ghost is what you make of it. If you want a traditional DuPont reach around, this is far more deviant and some people will pay a premium for that kinda yeasty endeavor.